So you have finished your basic enterprise architecture training course like TOGAF Definition 9.1 or ArchiMate Definition 2.1 and got certified maybe even in both of them. Now the phase starts of applying your knowledge in practice. Too often architects then face two problems. Problem 1: You have no time to really carry out the architecture process prescribed by TOGAF. The second problem is: people don’t understand your architecture models. They find them too technical and doubt if they are the target audience for these models. These two problems cause that fewer architecture products are being asked from you as an architect and that your architecture products certainly won’t be used to support strategic decision making. Unused architecture products are a waste of time and money. This definitely does not have to be the case! 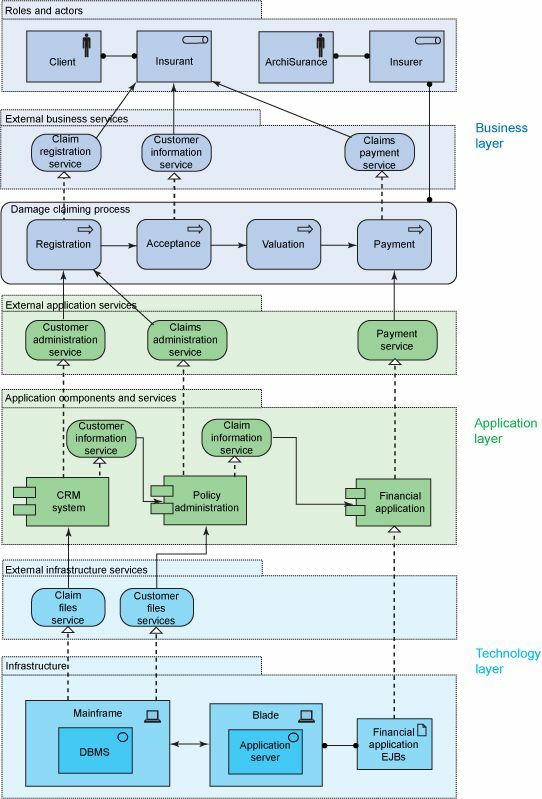 Figure 1, Example of a typical useful ArchiMate diagram often created by architects, but not understandable for CxOs or Management and therefore not used to support their decision-making. Figure 2, Example of a TOGAF diagram showing a distributed computing architecture. Not everyone knows anything. And also not everyone is interested in everything. These two things are very important to remember when visualizing and communicating an architecture product to your target audience. So when you create an application landscape diagram with schematic symbols containing technical information, your CIO hardly knows how to use it to support his decisions to align the application landscape with the new business strategy. And if you create an IT infrastructure landscape with a lot of symbols looking the same or have no meaning for the viewer, many IT managers really do not know how to use it to support their decisions to standardize and lower costs in the IT infrastructure landscape. So what you need to do is to visualize the application landscape and IT infrastructure landscape for its situational purpose of supporting decision-making by CxOs and Management. If you do this successfully your stakeholders will love and use your architecture products. When looking at your job profile you will see what professional products your stakeholders are requested, directly and indirectly. For many IT architects, this means they really should start producing the application landscape, part of application architecture and the IT infrastructure landscape, part of the IT infrastructure architecture. And keeping them updated. So know you know what to do, but now you still need to get time to do it and find out why people would want to use it? Why is it essential to them? 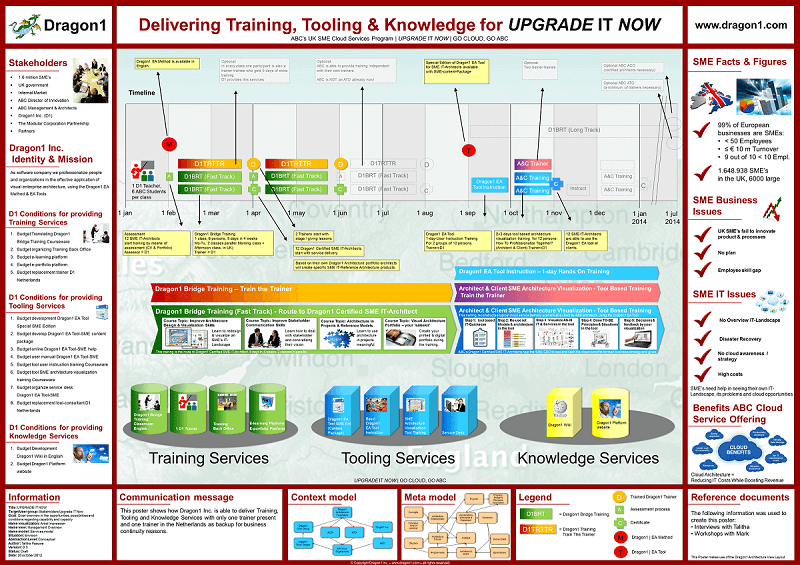 Practice shows that large A0 sized overview posters of application landscapes and IT infrastructure landscape, when understandable and pretty complete for stakeholders, enable and support decision-making. Knowing this you might take the next step of inspiring the owner/client of the company and the company’s stakeholders by showing them example landscapes and tell them you could create these for them so they can get ongoing with a decision that is already waiting for months or years to be taken, blocking the execution of strategy or realizing goals. Figure 3, Example of a Scenario Planning Roadmap for new Services and Training on Dragon1 aimed at CxOs to show when consultants are trained in the new services of the company. And you just maybe get an assignment from your owner/client and his stakeholders. With that, you suddenly have time and budget to create the application landscape and IT infrastructure landscape. Last but not least: check out examples of visualizations that your stakeholders use for taking decisions. Analyze the information put on these visualizations, what symbols are used to show functions, attributes, patterns, relationships with strategy and goals, etc.. And verify what is NOT shown (maybe certain technical information). If you do all this you may be well on your way to create architecture visualizations that are used for strategic decision-making. Next to TOGAF as Architecture Framework and ArchiMate as EA Modeling Language, there is Dragon1 as open EA Method and EA Framework. Dragon1 EA Method contains a innovative way of thinking, way of working, way of representing and way of working with Enterprise Architecture at a strategic decision making level. In the Dragon1 open EA Method the architecture definition states that architecture is a total concept [def.] (i.e. a coherent whole of co-operating concepts). Architects are seen as the designers of these total concepts and as supervisors of the realization of structures with the total concept applied onto it. This means that you as architect should create visualizations of the stakeholder’s requirements, architecture principles and concept designs and have the owner/client and stakeholder approve them, so the design can be used and realized in projects. as one of the methods in which you can certify as architect? In Dragon1, architecture is positioned as total concept and with that as enabler of controlled execution of fundamental strategic change (risks are managed). In the framework, in figure 4, you’ll see how enterprise architecture translate strategy into blueprints, landscapes and roadmaps and how these are used by projects as guiding framework for the realization of solutions. Figure 4, Dragon1 Enterprise Performance Framework. Now you can use all your knowledge you gained during the TOGAF and ArchiMate training and create architecture products compliant to these two standards. Next you’ll create blueprints, landscapes and roadmap based on Dragon1 to visualize the architecture products to the right target audience. This will make owner/client and stakeholder approve your architecture products and use them in projects. What more do you want as architect. Maybe to play a significant role in the project supervising the realization to minimize the architecture deviations. Dragon1 as EA method will keep a close look on the TOGAF next version and ArchiMate next version and make sure that you always as architect will benefit from using Dragon1 EA Method in addition to TOGAF 9.1 and ArchiMate 2.1. Like I have started of this blog, I can repeat: Enterprise Architecture does not end with TOGAF 9.1 and ArchiMate 2.1. Suppose you want to learn about Visual Enterprise Architecture the Dragon1 way. You can enroll for three training courses. Dragon1 EA Method Training Curriculum provides for a level 1 certification training course with Dragon1 Foundation and a level 2 certification training course with Dragon1 Certified. For architects with prior knowledge of working with Enterprise Architecture or even certification in TOGAF and ArchiMate, the Dragon1 EA Method Training Curriculum provides for a bridge training. The Dragon1 Bridge Training is the optimal training course that offers the participant his unique and own training course program skipping known theory and paying more attention to creating architecture visualizations. How does Dragon1 help projects that are running out of time and budget? What are top priority views to create of your application landscape?